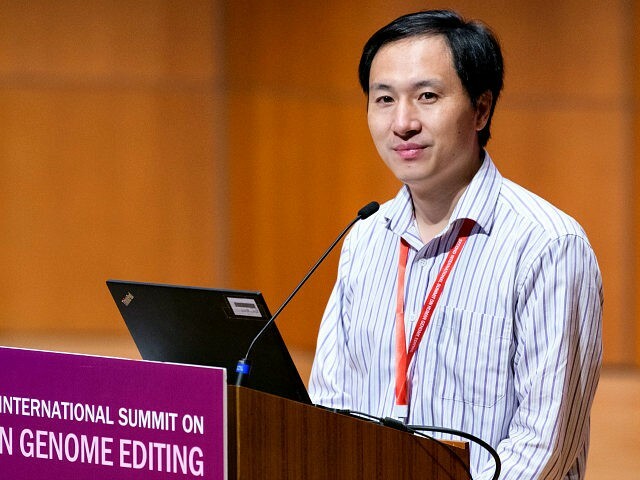 On Monday, just hours after Chinese authorities confirmed the birth of twin girls whose DNA was purportedly edited by scientist He Jiankui, the university that employed He announced his termination. It looks increasingly likely that he will face criminal charges, although a Western scientist that has been communicating with him said He is currently under protective custody rather than house arrest. The Southern University of Science and Technology in Shenzhen announced on Monday that it will “rescind the work contract with Dr. Jiankui He and terminate any of his teaching and research activities,” effective immediately. Monday’s report from investigators in China’s Guangdong province suggested he will face prosecution for violating medical ethics laws. CBS News quoted bioethicist Dr. William Hurlbut of Stanford contradicting rumors that He is already under house arrest. According to Hurlbut, He Jiankui is keeping a low profile but is not being held incommunicado, and ominous individuals spotted around his apartment are there for his protection not to keep him under house arrest. Hurlbut said he spoke with He as recently as last week and found him “calm,” “thoughtful,” and pondering “what he should have done differently.” The Chinese scientist told Hurlbut the authorities are treating him “respectfully,” and the plainclothes officers posted around his university apartment have instructions to keep the media and other unwelcome visitors at bay. He said he was permitted to walk around the university campus if he wished, which is not quite the same thing as having unrestricted freedom of movement. China’s state-run Global Times on Tuesday signaled He Jiankui can expect prosecution for defying bans on editing the DNA of human embryos while admitting China’s laws on the matter are vague and largely untested. He’s work has imposed adverse effects on China’s scientific ethics. More importantly, it opened a Pandora’s Box of human genome editing. Now that there is a “modern-day Frankenstein,” our law should keep pace with breakthroughs in the area. Chinese President Xi Jinping said in a speech on Monday that efforts should be made to accelerate establishing an early warning and monitoring system to ensure scientific and technological security, as well as to promote the legislation work concerning artificial intelligence, gene editing, medical diagnosis, autopilot, drones and service robots. In another interview, Dr. Hurlbut said his exchanges with He Jiankui indicated a second woman involved in the gene editing experiment is now 12 to 14 weeks along in her pregnancy. “I get the impression the baby was fairly young when the conference happened. It could only be detected chemically, not clinically,” Hurlbut told AFP, calculating the baby would have been four to six weeks old at the time of the conference in November.